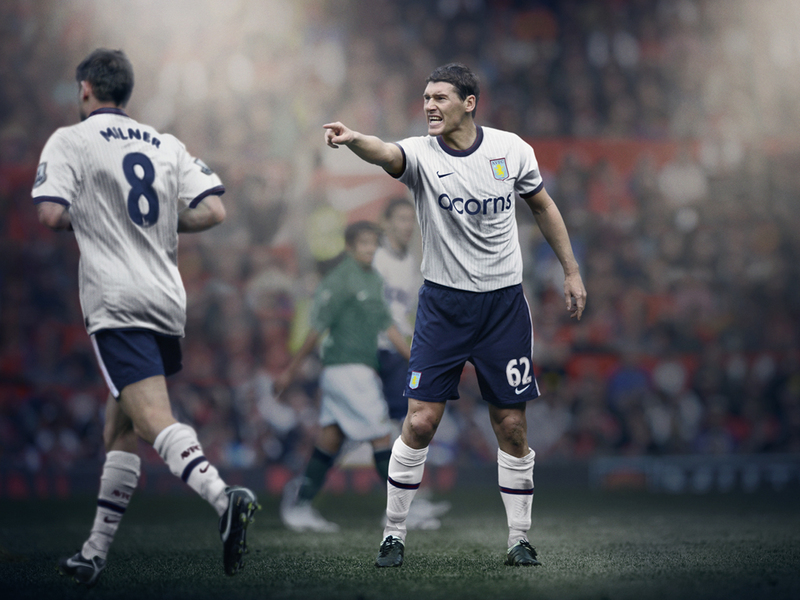 This is Aston Villa’s new away shirt for the 2009/10 season. As you can see, it’s made by Nike, it’s very stripey (though the stripes are subtle) and I think it looks rather smart. I much prefer it to other Swooshy designs I’ve seen for next season (Arsenal’s nasty dark blue away shirt, for example). arsenal’s nasty blue number that will be in the champions league you mean? 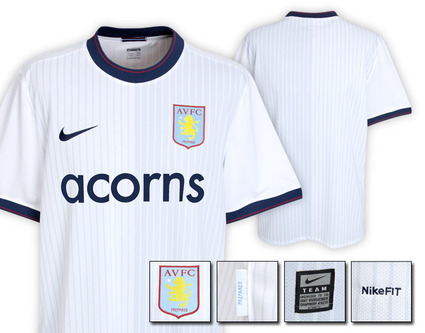 Are the pinstripes Nike’s new design idea then?? hang on a second mate ure lucky that ure in the champions league this season as since january villa were in 4th n 3rd n uu were in 5th n 6th i meen ffs kidda uu put arsenal as a top 4 team .. ent top 4 teams ment to win trophys ,, its fair to say at the moment you are the shittest team in the top 4 so dont get too cocky and comftable about playing in the champions league beacuse in the next couple of seasons belive me u wont be .. and as for the kit .. dont get jelous beacuse we’ve got a better kit then you . thats just childish kid. mattydub, you are truly a fool of the highest order. I would think Top 4 clubs are meant to finish in the top 4, which is the absolute pinnacle your small club could hope for. Sure, Arsenal did not have a succesful season by our very high standards, but the season prior we gave away the league, and next season we’ll be back where we belong. As will you, mid-table obscurity. Just for the record Jack Straw, you’ve never won the European Cup…Aston Villa have and you can never take that away. Keep trying to conceal your jealously though while you support Arsenal ‘United’ you prawn sandwich eating idiot. Also, Arsenal aren’t in the champion’s league-they’re in the qualifiers. If you weren’t to make it, your crappy kit will be in the eurovision league just like the rest of us. I can handle the blue away kit but them pinstripes have got to go!